Surfers, start your engines: Nissan has introduced the Titan Surfcamp concept, a truck outfitted to take on practically any beachside journey imaginable. The Titan Surfcamp starts out as a 2018 Titan XD Midnight Edition, brought to life through a wildly comprehensive and diverse range of upgrades and accessories. A meaty set of Nitto Ridge Grappler tires measuring 35/12.5/17 at all four corners are designed for bounding effortlessly through sand, while an ICON lift kit boosts ground clearance by 3 inches over the Titan’s standard ride height. Up front is a Fab Four Vengeance bumper for extra protection against gnarly sand dunes and there are also integrated fishing rod holders. Rounding out the package is a funky exterior wrap inspired by the color of a 1967 Nissan Patrol as well as retro surf culture and a 1971 Hot Wheels Datsun Bluebird Wagon. Inside, surfers will appreciate the seat covers inspired by wetsuit material and rubber mats to collect sand, while a roof rack system can accommodate surfboards, paddleboards, and fishing rods. Long day at the beach? Freshen up with the rack-mounted solar shower and keep the feet sand-free on a teak wood deck. When it’s time to hit the pillow, a hard-sided roof-mounted tent offers shelter from the elements. The Titan Surfcamp is the latest in a line of Titan project vehicles geared towards outdoor activities. 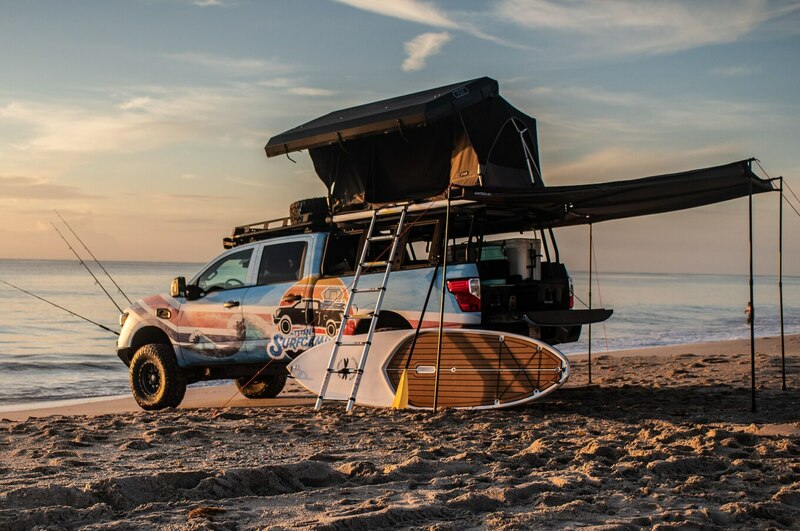 Currently, Nissan has no plans to sell the Titan Surfcamp in production form, though all of the accessories can be purchased separately for a faithful re-creation. Those wishing to take a closer look at the Titan Surfcamp can catch it in person at the International Convention of Allied Sportfishing Trades event from July 10-13 in Orlando, Florida, or the Supergirl Surf Pro competition from July 27-29 in Oceanside, California.